DNA and RNA – Reprogramming the code of life Although DNA and RNA both carry genetic information, there are quite a few differences between them. Let's try to resolve them. "Are you completely confused by all the talk about DNA and RNA? Let&apos;s try to resolve by taking the tour of basics". A good part of who we are is "written in our genes", inherited from our parents. Many traits, like blue eyes, red or brown hair, body shape and even some personality quirks, are passed on from parent to offspring. It is also true, that changes in DNA and RNA can produce changes in proteins, with different gene expression. Thus, it is the story of genes that makes each one of us unique. First molecules of life – Life&apos;s origin – (RNA) One view is that an RNA world existed on Earth before modern cells arose. According to this hypothesis, RNA stored both genetic information and catalyzed the chemical reactions in primitive cells. Only later in evolutionary time did DNA take over as the genetic material and proteins become the major catalyst and structural component of cells. All modern life on Earth uses three different types of biological molecules that each serve critical functions in the cell. The structure of the nucleic acids in a cell determines the structure of the proteins produced in that cell. Since proteins are the "building blocks" of life, nucleic acids can be considered the "blueprints" of life. Proteins are the workhorse of the cell and carry out diverse catalytic and structural roles, while the nucleic acids, DNA and RNA, carry the genetic information that can be inherited from one generation to the next. Many people are familiar with deoxyribonucleic acid (DNA), which is often referred to as the &apos;building blocks of life&apos; because it contains the genetic material for its parent organism. RNA is equally important, even if it is lesser known, because RNA plays a critical role in helping DNA to copy and express genes, and to transport genetic material around in the cell. RNA, which stands for ribonucleic acid, is a polymeric molecule made up of one or more nucleotides A strand of RNA can be thought of as a chain with a nucleotide at each chain link. Each nucleotide is made up of a base (adenine, cytosine, guanine, and uracil, typically abbreviated as A, C, G and U), a ribose sugar, and a phosphate. RNA also has a number of independent functions which are no less important .Ribonucleic acid (RNA) is a chain of nucleotides present in the cells of all life. RNA has a number of important functions for living organisms, ranging from the regulation of gene expression to assistance with copying genes. RNA plays a central role in protein synthesis. The central dogma of molecular biology suggests that the primary role of RNA is to convert the information stored in DNA into proteins. In reality, there is much more to the RNA story. One of the most frequently asked questions about nucleic acids is: What is the main difference between DNA and RNA and chemically how they both differ from each other? Nucleic Acids are the organic compounds found in the chromosomes of living cells and in viruses. These are mainly two types of nucleic acids, which differ slightly in their chemical composition. Deoxyribonucleic acid (abbreviated DNA) ordinarily occurs only in the cell nucleus, which have nucleotides A, T, G, C, whereas in Ribonucleic acid (abbreviated RNA) is found both in the nucleus and in the cytoplasm and consists of A, U, G, C nucleotides. (where Thymine is replaced by Uracil in RNA). Thus, DNA and its chemical cousin RNA are unique in their ability to encode information and to pass it on through heredity. 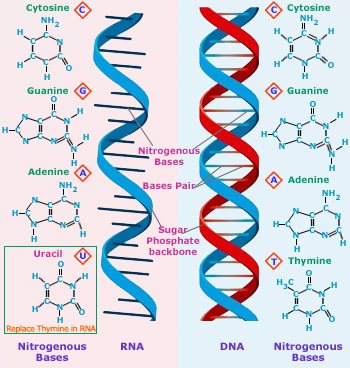 Nitrogen bases of both DNA and RNA The four bases found in DNA are adenine (abbreviated A), cytosine (C), guanine (G) and thymine (T). A fifth pyrimidine base, called uracil (U), usually takes the place of thymine in RNA and differs from thymine by lacking a methyl group on its ring. 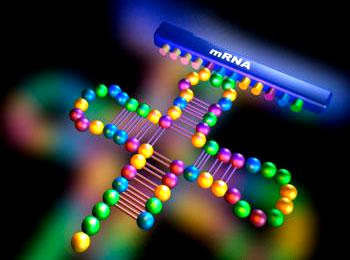 The molecular structures of DNA and RNA are very similar. 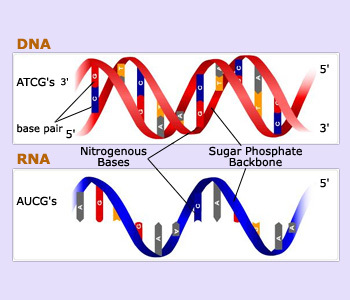 Nucleic acids have a long "backbone" consisting of alternate sugar and phosphate molecules. The main difference between DNA and RNA is that the ribose sugar backbone in RNA has a hydroxyl (–OH) group that DNA does not have. This gives DNA its name: DNA stands for deoxyribonucleic acid. DNA is double stranded, whereas RNA is single stranded and another minor difference is that DNA uses the base thymine (T) in place of uracil (U). Thus, we put together – The main difference between DNA and RNA is the sugar present in the molecules. 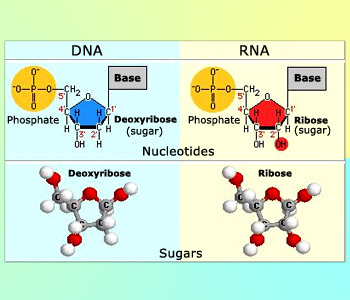 While the sugar present in an RNA molecule is ribose, the sugar present in a molecule of DNA is deoxyribose. Deoxyribose is the same as ribose, except that the former has one more OH. DNA does not usually exist as a single molecule, but instead as a tightly–associated pair of molecules. These two long strands entwine like vines, in the shape of a double helix. This arrangement of DNA strands is called antiparallel. The asymmetric ends of DNA strands are referred to as the 5&apos; (five prime) and 3&apos; (three prime) ends. One of the major differences between DNA and RNA is the sugar, with 2–deoxyribose being replaced by the alternative pentose sugar ribose in RNA. The four bases found in DNA are adenine (abbreviated A), cytosine(C), guanine(G) and thymine(T). A fifth pyrimidine base, called uracil (U), usually takes the place of thymine in RNA and differs from thymine by lacking a methyl group on its ring. Difference between ribose and deoxyribose In ribose, carbon atom #2 carries one hydroxyl group (colored red). In deoxyribose, carbon atom #2 carries a hyrogen atom instead of a hydroxyl group. Despite great structural similarities, DNA and RNA play very different roles from one another in modern cells. Genes, the basic units of heredity, consist solely of DNA (or RNA, as in some viruses). The DNA within a cell can be thought of as a template, from which proteins are built. A type of RNA called messenger RNA, or m–RNA, transmits information from DNA to the ribosomes, structures in the cytoplasm that assemble amino acids into proteins. Transfer RNA, or t–RNA, transports amino acids from the cytoplasm to the ribosomes. Another form of RNA, called r–RNA, is part of the structure of the ribosomes. Other forms of RNA act as enzymes, or catalysts, in protein production. 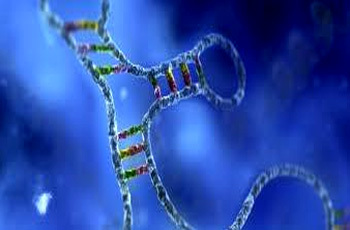 RNA plays a central role in the pathway from DNA to proteins, known as the "Central Dogma" of molecular biology. An organism&apos;s genetic information is encoded as a linear sequence of bases in the cell&apos;s DNA. 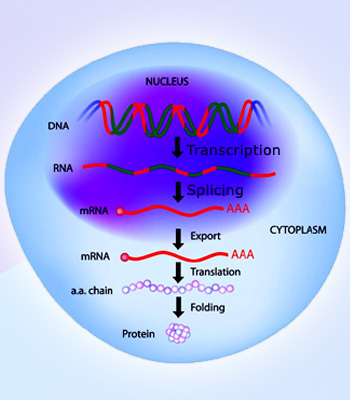 During the process known as transcription, a RNA copy of a segment of DNA, or messenger RNA (mRNA), is made. This strand of RNA can then be read by a ribosome to form a protein. RNAs also play important roles in protein synthesis. Information stored in DNA is needed to replicate DNA. Information stored in DNA is needed to make proteins. The Messenger – mRNA is an intermediate copy of genetic information that guides protein synthesis. The Carrier – tRNA carries amino acids to the ribosome . The Machinery – rRNA is an essential component of the ribosome. Protein catalysts (enzymes) are needed to interpret genetic information, but they are also the product of this interpretation. Central dogma of molecular biology Explains the flow of genetic information within a biological system. DNA is exclusively found in the nucleus except for small amounts in the mitochondria and the chloroplast.